Beef, soy sauce, worcestershire sauce, vegetable glycerin, liquid smoke, garlic, onion, pepper, spices, smoke flavor added. The first thing I taste from the surface of these pieces is an saucy flavor with a noticeable garlic, touches of pepper, and hints of sweet. The chewing brings in a more defined blend of soy sauce and worcestershire, while the smokiness comes out in a light amount. The garlic is touch more noticeable, along with a little onion and black pepper. For being marketed as "Smokehouse Hickory Beef Jerky", this jerky seems to hold up. I do pick up a light smoky flavor in the chewing, but overall it's subtle. Otherwise, the flavors that define this jerky is largely the saucy combination of soy sauce and worcestershire, with a more pronounced garlic. The onion is lightly noticeable in the background, while the black pepper creates a spicy, aftertaste in the back of my mouth. The natural meat flavors come out really well in this. 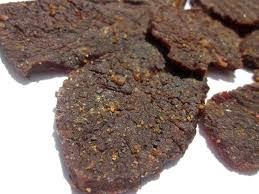 Together, the ingredients combine to create a "Steakhouse" style jerky, with the marinade going deep into the meat and the bold seasonings of garlic, onion, and pepper give each bite a lot of pop, as if you've taken a bite of steak right off the grill. The level of saltiness in this feels moderate to high, while the level of heat is mild. The black pepper, however, creates a fair amount of spiciness. This is a dry jerky with an oily surface feel. There's a light amount of flexibility, but pieces will crack easily apart. Chewing varies from easy to moderately tough. The chewing texture starts out with a fair to heavy amount of initial chewing resistance. With a good deal of chewing, it takes on a dry, but meat like feel. Once chewed down to a soft mass, it feels exactly like a piece of real steak, cooked well done. I see only small bits of fat on these cuts, while no gristle or tendon. I didn't encounter any stringiness or other unchewable tissues. It's very meaty. In terms of clean eating, my fingers pick up a light oiliness, with bits of seasoning, requiring a licking and wiping before touching the keyboard. 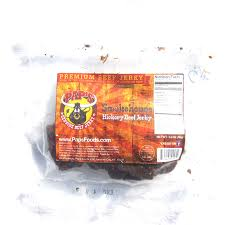 Pap's Beef Jerky sells this Smokehouse Hickory variety at a price of $6.99 for a 3.5oz package. Right now, Pap's is running free shipping. That works out to a price of $2.00 per ounce. 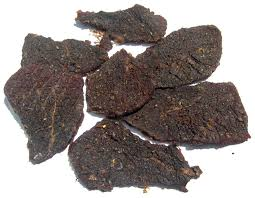 For general jerky snacking purposes, at the $2.00 per ounce price, it's a good value. I'm getting a great overall flavor, good meat consistency, and good chewing texture. Compared to other gourmet brands of jerky, it's a better snackability as a whole. As "Smokehouse Hickory" beef jerky, at the same $2.00 per ounce price, it's also a decent value. 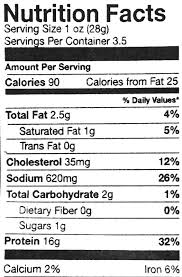 I pick up a light smokiness overall, but there's also so many other flavors going on in this jerky, it's perhaps more difficult to identify. This Smokehouse Hickory beef jerky from Pap's Beef Jerky offers a light smokiness over a bold, saucy tasting jerky that mimics something from a steakhouse. There's a savory saucy marinade deep into the meat sandwiched by a lively blend of chopped garlic, onion, and black pepper, giving this jerky that sense of eating a steak right off the grill. There isn't any heat to this, but the level of spiciness just from the seasonings is bold enough to create a lively meat chewing experience, particularly when my teeth bit into a chunk of chopped garlic. The natural meat flavors come out really well in this, making this jerky taste like a real steak. This Smokehouse Hickory variety is strangely, very much like the company's Original beef jerky, but with a little more smokiness. It's the same great meat consistency, good chewing texture, and thick slices of beef.